Senior Tim Dombroski (left) and instructor Kimbel Westerson, with the College of Humanities and Social Sciences, look forward to National Day on Writing. Whether we realize it or not, we write every day. We text and send emails. We record events and feelings in journals and diaries. We jot ideas and reminders on sticky notes. That’s what the Oct. 20 National Day on Writing — which GCU is celebrating — is all about, said Kimbel Westerson, English instructor for the College of Humanities and Social Sciences. “It’s about celebrating how we use language and the written word to enrich our lives,” said Westerson, chair of the committee organizing GCU’s activities. Organizers hope to attract many members of the University community to fun and popular events. From 11 a.m.-3 p.m. Oct. 20, passersby can enjoy writing activities at two tables on the Promenade outside Buildings 6 and 16. There will be four “extend-a-story” boards on which each person adds a sentence to a story. “It was really successful last year,” said senior Tim Dombroski, Friends of the Pen president, Startlebloom editorial board member and National Day on Writing master of ceremonies. One story, he said, was originally about a traveler in a mystical, warlock-filled land. But one contributor added a random sentence, posing a challenge for those who followed. “It forces you to be really creative as the next person has to level things out to continue the narrative,” Dombroski said. In the end, he said, the whole story wound up as a dream. In another activity, participants can find their inner poet by using sidewalk chalk made available for the purpose of creating “chalk poetry,” Westerson said. Also, using markers and sticky notes, passersby can sum up their lives in six-word autobiographies. The results will be placed on an easel to encourage others to contribute, Westerson said. The last event of the day is a Friends of the Pen literary reading, with Dombroski as emcee, which will take place from 5-7 p.m. Submissions were requested and the winning entries selected, Dombroski said. 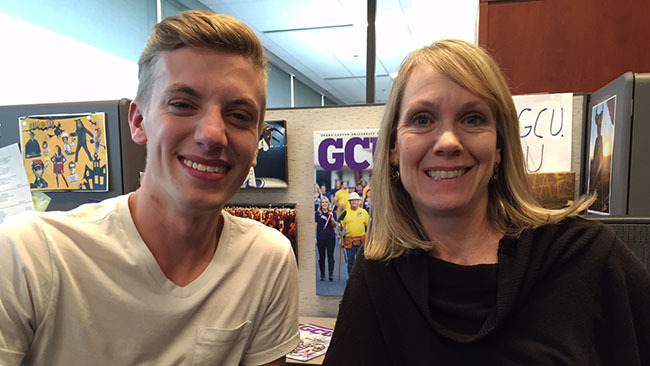 GCU’s literary community is flourishing and attracting more writers in part because of a new degree, Dombroski said. “We just recently got a new major, a (Bachelor of Arts in English with an emphasis on Professional Writing), which is a huge, huge thing for this school and something that Friends of the Pen has been pushing for,” Dombroski said. The degree is broader than just writing English essays, Westerson said.